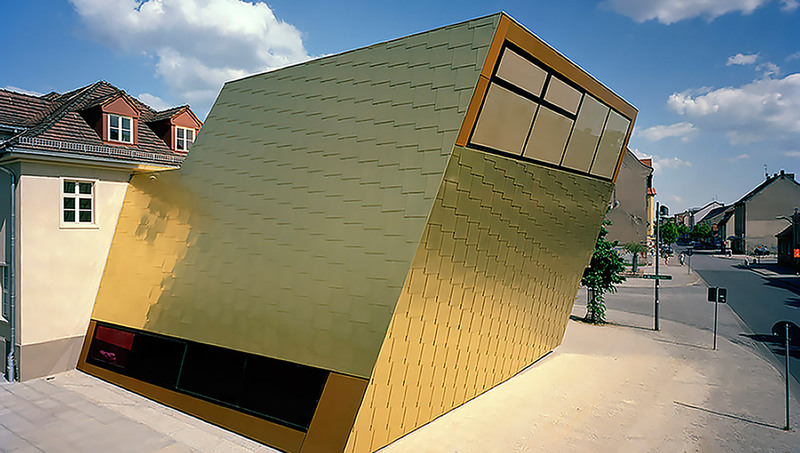 Shingles are what is known as a ‘traditional’ cladding style’, generally utilising hard metals such as copper, zinc and stainless steel. 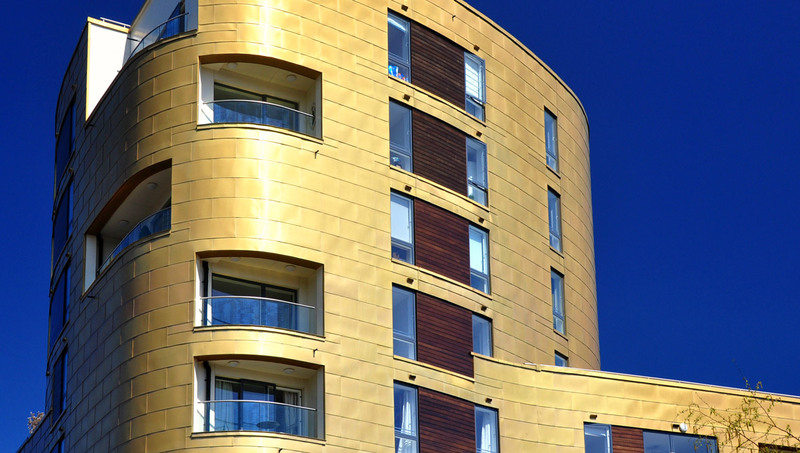 However, this type of cladding is being increasingly used within contemporary architecture in a wide variety of metal and finishes. Aesthetically, shingles have a distinctive look due to the thin gauge of metal used to manufacture them, and when specifying, the flatness and reflectivity of the material should be considered. Suitable for complicated geometries and curved surfaces. Square, Rectangular and Diamond shape shingles. A range of different sizes individually produced for every building. Installed aligned or staggered, horizontally, vertically and at an angle. 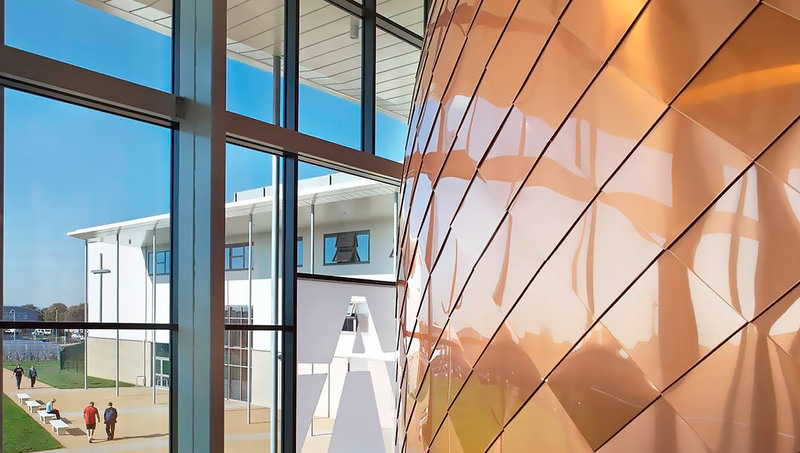 A range of metals, including copper, zinc, stainless steel and aluminium. Large façade areas can be covered quickly and economically. All folds and notches are automatically pre-processed in our UK factory. Sizes set to utilise the individual material parameters for best utilisation. 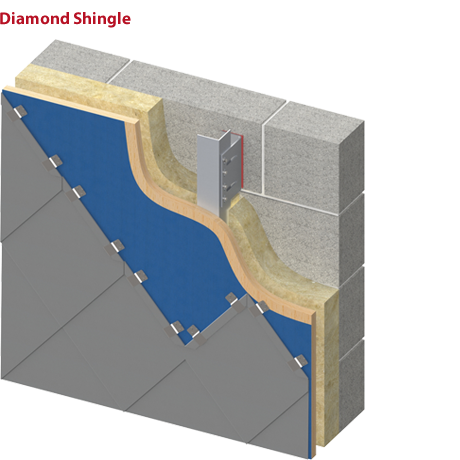 The shingles are fully interlocking on all four sides and have a 22mm 180 degree folded hem to all four sides with two reverse-side and two face-side. 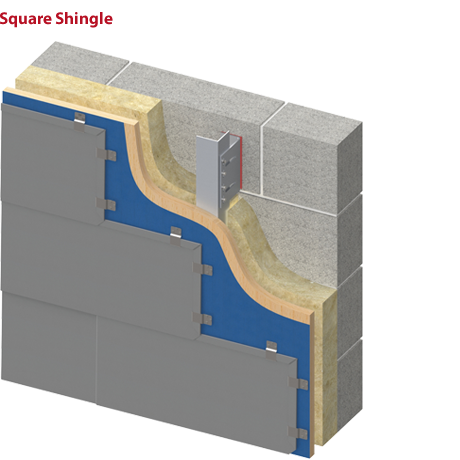 The shingles are secured with concealed fasteners and clips; due to the thin gauges of materials used they are “fully supported” due to the lack of inherent spanning capability. Shingles in general are fixed to a compatible wooden framework or plywood boarding with suitable gaps between the boards to allow for expansion. The board is then fixed to a metal support system or masonry support with a continuous 38mm ventilated air gap left clear behind the boarding on the entire façade, with ventilation openings at the top and bottom. Any wood treatment products (fungicides, insecticides) must be dry and completely neutral to the metal which the Proteus Shingle is manufactured from. The fastenings for the wood or metal supports should be countersunk to avoid any contact with the Proteus Shingle.